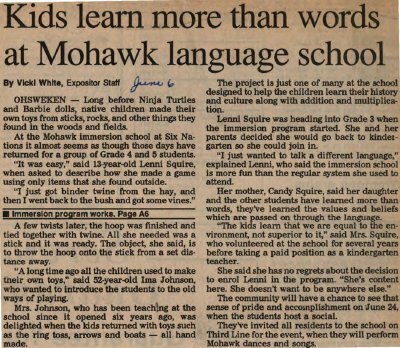 "Kids learn more than words at Mohawk language school"
OHSWEKEN - Long before Ninja Turtles and Barbie dolls, native children made their own toys from sticks, rocks, and other things they found in the woods and fields. At the Mohawk immersion school at Six Nations it almost seems as though those days have returned for a group of Grade 4 and 5 students. "It was easy," said 13-year-old Lenni Squire, when asked to describe how she made a game using only items that she found outside. "I just got binder twine from the hay, and then I went back to the bush and got some vines." A few twists later, the hoop was finished and tied together with twine. All she needed was a stick and it was ready. The object, she said, is to throw the hoop onto the stick from a set distance away. "A long time ago all the children used to make their own toys," said 52-year-old Ima Johnson, who wanted to introduce the students to the old ways of playing. Mrs. Johnson, who has been teaching at the school since it opened six years ago, was delighted when the kids returned with toys such as the ring toss, arrows and boats - all hand made. The project is just one of many at the school designed to help the children learn their history and culture along with addition and multiplication. Lenni Squire was heading into Grade 3 when the immersion program started. She and her parents decided she would go back to kindergarten so she could join in. "I just wanted to talk a different language," explained Lenni, who said the immersion school is more fun than the regular system she used to attend. Her mother, Candy Squire, said her daughter and the other students have learned more than words, they've learned the values and beliefs which are passed on through the language. "The kids learn that we are equal to the environment, not superior to it," said Mrs. Squire, who volunteered at the school for several years before taking a paid position as a kindergarten teacher. She said she has no regrets about the decision to enrol Lenni in the program. "She's content here. She doesn't want to be anywhere else." The community will have a chance to see that sense of pride and accomplishment on June 24, when the students host a social. They've invited all residents to the school on Third Line for the event, when they will perform Mohawk dances and songs. Johnson, Ima ; Squire, Lenni ; Squire, Candy.